There are many Google "productivity apps" but here are two of their "To Do" list making tools. With the "Tasks" tool you can make lists of things you need to do and check them off when done for that feeling of accomplishment. You can have the main list and sub points under a point. You can find a link to it in the upper left of your gmail program (see image) or you can also access it from the calendar app. 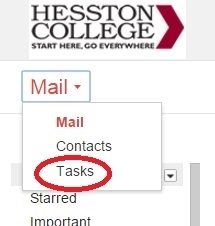 After you click on the Task link it will appear as a window in the lower right of your screen, that you can then expand it. Google Keep is a electronic list tool that is more visual. You can make lists of things to do, either via typing them in, or when you are on your mobile device, by saying them with your voice or by taking a photo. They appear like "post it notes" on your screen. You can find this tool/app via the 9 dot Google Apps area in the upper right corner when you are in either your email or calendar. When you click there, you have to click on "More" and then "Even more from Google" and then you will need to scroll down a ways and in the "Home and Office" section. Look for the "Keep" name with a yellow light bulb icon and click on it to use it. While in the program, if you think you might use it, click again on the 9 dot icon in the upper right and then by the Keep icon, click on the option to add a shortcut. Next time you are log into your Google account, you will find the Keep icon in that area with your other common Google tools. Like always, contact me if you have any questions on Google tools.